I was so very inspired this morning when I read Deb's "revived" post from 2009 about labeling and creating labels for our quilts. When she wrote: "I enjoy designing the label as an extra piece of art. "...I couldn't help but stop and question myself for not doing the same. She uses a greeting card program and gave all the details for creating a variety of creative labels for our quilts. I was so very inspired and think you will be too!! Thanks for writing and rejuvinating such an informative and inspiring post Deb. This is definitely one that needed to be "revived"! Deb blogs at Stitchin' Therapy and you can click HERE to check out her wonderful post. Thanks Val! Love your weekly linky to make me look back. Most of us have great info in the old posts! I saw that post in my blog feed too, brilliant!! I have been meaning to do a post on labels but just haven't gotten to it yet. Maybe that should be my one monthly goal? I love the label. I'm going to go read that post! 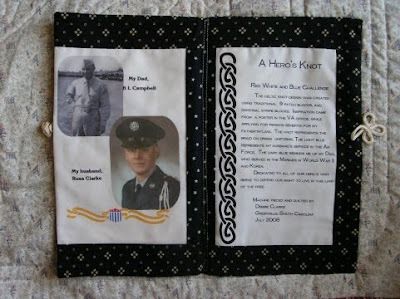 I like your story of the quilt your aunt made, along with its well-washed hand written label. There are some very inspiring labels being shown here. Mine are always simple, rather like your aunt's. So simple I would never write a post about them! Labels are a GREAT topic for the linky this week! It's so easy for the label to be just a hasty afterthought, but especially with a gift quilt, the personalized label is often the most appreciated part of the whole quilt to the person who receives it. What a special label really says is "this quilt was made JUST FOR YOU." 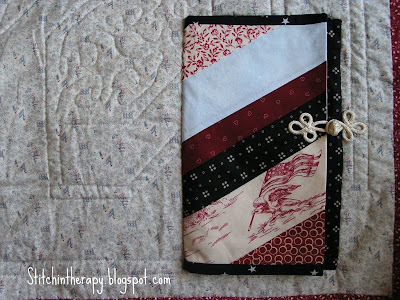 I also feel that a label is another chance to add yet another "creative spin" to your quilt or the backing. Deb always does such great things with her projects and can't wait to read about what others have done! A wonderful linky today - love visiting everyone's posts. I admit that I am very lackidazy when it comes to labels. You're right, it's a wonderful and inspirational post. I don't have any great label like this, but I'll try next time. Okay...I here by commit to labeling ALL my quilts after visiting all your posts! Thank you for the inspiration and can do label ideas! Some intrinsic, some simple....all doable!! Lots of fun labels. Sometimes I struggle with the label and sometimes I just know what it is going to look like.